Explore la historia de la ciudad de Belice en un recorrido personalizado. Vea los lugares de interés histórico, como los templos mayas, un faro, Ladyville y King's Park, un área rica donde viven muchos médicos, abogados, políticos y otros residentes influyentes. 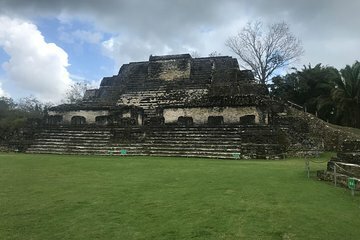 Pasee por los vecindarios locales, visite áreas naturales y disfrute de tiempo libre para comprar o relajarse en el sitio arqueológico de Altun Ha. Visita al sitio arqueológico de Altun Ha. Our guide was Dennis and he picked us up from our B and B and drove us to Altun Ha. He taught us a ton about Belize City and the ancient Mayan civilization. We had so much fun visiting the ruins! Dennis met us at the port, he held a sign with the name of our excursion so that made it really easy to find him. He was very friendly and informative, he told us about the city as were making our way to the Altun Ha ruins. After our excursion he took us to a good hamburger place to eat and drove us back to the port. If you haven't seen this ruin and you are interested in the history of it I would highly recommend using Dennis for this tour.